The Constitution tab shows your board's constitution and governors' terms of office, including current vacancies. To edit the constitution, click on the Edit the governing body constitution button. You can choose either a set number of each governor type, or tick the Range box to set a minimum and maximum number of a governor type. 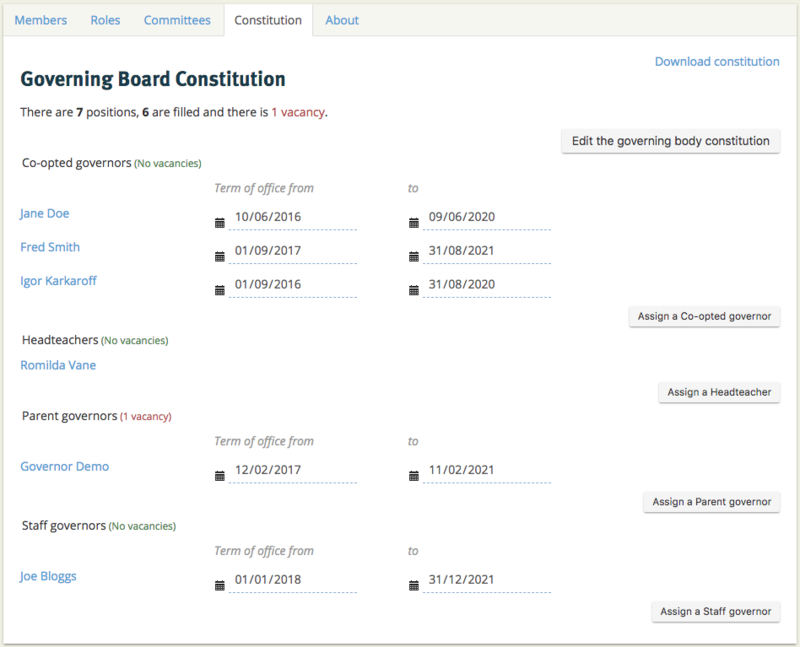 Once you've set up the constitution, you can assign governor types by clicking on the Assign buttons. You can then start typing in the name of one of your governors, and choose the right person from the dropdown that appears. Once they are added, you can set their term of office using the date fields next to their name. You can also set someone's governor type and term of office by clicking on the dropdown arrow to the left of their name in the members list.